Tree Stump Removal Shelby Township: Why Rid Yourself of the Stump? If you’re wondering whether or not you should go through the hassle of seeking out a stump removal service for that long abandoned remnant of an old tree in your yard, then consider these tremendous benefits stump removal poses over doing nothing. If you’re on the fence about whether or not to take out that pesky stump in your yard, we can help to make that decision a little easier. 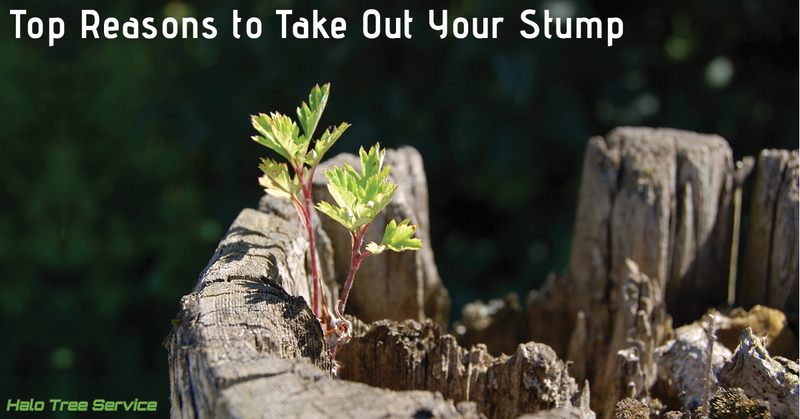 Today, we’ll share a few great reasons as to why that stump is a bit more of a pest than it may seem. Plain and simple, one of the most commonly featured reasons as to why people want to rid themselves of a stump once and for all is because stumps just aren’t attractive. They can make even a nice home look like it’s in the midst of a project or make the homeowners appear lazy. Also, this poor look can have an impact on curb appeal, effectively diminishing your property value. For many Shelby Township homeowners, this reason alone makes it more than worth the stump grinding. Even when a tree is cut away from a stump, roots continue to remain firmly planted in the ground and often continue to grow for years. These roots pose a tremendous hazard for your mower blades, as well as any little feet that may be running and playing in the yard. In fact, stumps themselves can be quite hazardous to children; while a stump may look like a solid surface to play upon, they can become quite soggy once they begin to rot, not to mention that they are none too comfortable to fall upon when playing on or around. Removing the stump can save you more than a boo boo if a neighbor or guest were to injure themselves on or around it, as you would likely find yourself liable for the damages incurred. Nobody wants to hear the “t-word,” but a stump is an absolute termite magnet. Think about it, you have a substantial piece of slowly rotting wood in your yard, only feet away from your home, with roots that likely lead right to a deck or patio. Once termites infest your stump, it is only a matter of luck and time before they find their way to your home’s surfaces or interior. Even if you don’t catch the “t-word,” stumps attract other decay-feeding insects, such as ants, beetles, and more; none of which you want anywhere near your home or lawn. The final reason as to why you should remove that stump is because it is just annoyingly there. While a tree provides shade and beauty as a trade for the amount of yard space it takes up, a stump just sits there and looks ugly. Failure to remove the stump means that you’ll spend the rest of the time you live in your house mowing circles around a tree no longer there, carefully avoiding it whenever you play with the kids, advising people to watch their step, and wishing you could just forget it was there altogether. By removing the stump, you claim back that portion of the yard, put it to use for something better, and reclaim your peace of mind. At Halo Tree Service, we provide the best stump removal in the Shelby Township area, whether or not there is still a tree attached to it. Contact our team of dedicated tree care specialists to learn how we can help you take back your yard today! Check out our stump removal services and schedule with us here!